When it comes to geometry, vocabulary is super important. Not all geometry problems have nice and tidy answers, and will require that students use their background knowledge to find the answer. Furthermore, often times a student will use the verbal definition alone when attempting to memorize their math vocabulary, but without practice utilizing those terms, students may never fully understand or remember the vocabulary terms. 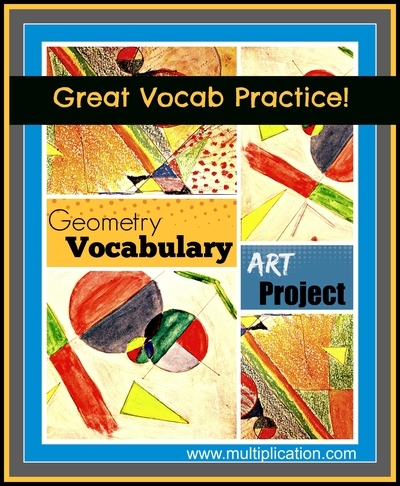 During this project, students will need to understand each vocabulWhen it comes to geometry, vocabulary is super important. Not all geometry problems have nice and tidy answers, and will require that students use their background knowledge to find the answer. Furthermore, often times a student will use the verbal definition alone when attempting to memorize their math vocabulary, but without practice utilizing those terms, students may never fully understand or remember the vocabulary terms. During this project, students will need to understand each vocabulary term enough to implement the creation of it on their papers. For example, students are asked to create a circle with the diameter of 3.5 cm. They are also asked to draw an obtuse angle anywhere they wish, draw a transversal line through two parallel rays, and even a triangle in which one angle measures 30 degrees, etc!